Needing to win the final race Lionheart stayed out of trouble this afternoon to score the required, definitive race victory which clinched the J Class Falmouth Regatta title only one point ahead of Velsheda. Not long after being built and launched the black hulled J came to Falmouth in 2012 and had to settle for third. Last year Lionheart won successively in Menorca, Majorca and Porto Cervo, but faltered badly at the last regatta of the season in Saint Tropez. But today, with all three Js able to win the regatta on the final race, Lionheart and the 'men in black' delivered to draw first blood of 2015. When they won the first race of the day, Race 6 of the series. Ranger, champion here in 2012, got back into contention to defend her Falmouth title. She took control of the right side of the course off the start line and lead from the first windward mark. With Velsheda second and Lionheart third the advantage going into the final race was still with Velsheda, topping the standings by a single point. The final race delivered the drama that the huge, diverse spectator fleet had turned out to see. The start proved close with Ranger and Velsheda going head to head, the first beat saw more umpire calls than the entire regatta until then and at the leeward gate Velsheda had no option, but to sail right into the spinnaker of Ranger after they lost control of it during an under pressure late drop. The 2012 champions were penalised and had to swoop down towards the spectator fleet to exonerate themselves, taking a penalty for failing to leave mark room for overlapped Velsheda. Ahead of all this, Lionheart sailed smartly and smoothly to beat Ranger by 42 seconds. Lionheart's tactician John Cutler, who previously guided Ranger to success on the same waters in 2012, expressed his feelings of pleasure and relief at Lionheart's win: "As a group we are really pleased to win. That is a tough race course and we had made it tough on ourselves after the third in the first race. The second race was quite exciting but we always knew we had to win that race to win the regatta. We were a little fortunate that Ranger and Velsheda tangled and gave us a small opening." 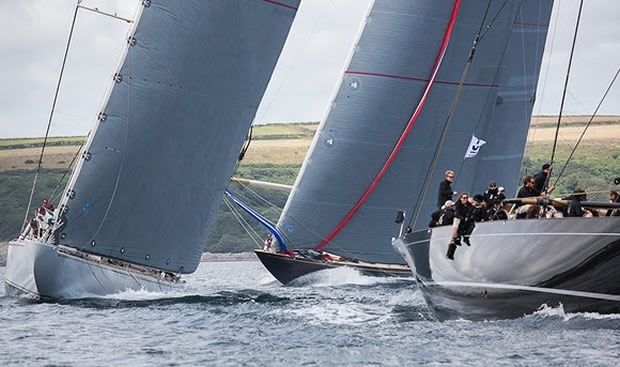 Racing in 10-14 knots of southwest breeze sparkling Cornish sunshine, with puffy clouds overhead and with thousands watching on the water and on land, Lionheart's starting is still their weakness but they were in position to benefit slightly after the gun when Ranger and Velsheda tussled. Velsheda started from a high, fast line at the gun and tried to roll over Ranger. Velsheda closed gauge steadily but could not quite break ahead. Ranger luffed and Velsheda tacked away. That left Lionheart to work the early left. They chose to duck Velsheda to get to the right, closer to the shore, where they found a little extra breeze and height to only just squeeze around the first windward mark ahead. Down the run Velsheda stayed well offshore and Ranger split down the shore and seemed to profit early but lose as the breeze softened on their returning gybe. At the leeward turn while Lionheart had their clear lead, Velsheda had an overlap on Ranger at the turn. Ranger was going quicker and should have been fine to harden up and close the door. But in the pressure of the late kite drop Ranger's sail billowed out the back of the boat. The Ranger crew had no choice but to release the spinnaker on to the face of their opposition. Velsheda took some minutes to extricate themselves, only just staying ahead of Ranger which had to take their penalty turn. But at the top of the second beat Ranger got back ahead when Velsheda stayed offshore and ran out of the best pressure. With a third, Velsheda get second overall counting three wins - the same as Lionheart - but also having three thirds in their scoreline, in turn finishing one point up on the quietly consistent Ranger which counted four second places. John Cutler explained: "Our guys did well on board, but it was hard. It was shifty and there was plenty of yelling. I guess Falmouth is good for me. I don't remember anything useful from then, all I remember was the rain and fog, but you can see the effect of the river here. And the wind pressure tries to wrap round the headland from the Lizard and sometimes it makes it over the land and so you often have two distinct things going on. "I think the boat is going quite fast and when we got off the start line we generally sailed the boat pretty well once we have got off the start line. "Starting is not our strength yet. We are not starting as well as Ranger and Velsheda are and so much is down to the starts." Cutler reaffirmed that the Lionheart team - as with the other J Class crews - have relished sailing in front of the crowds of spectators, and applaud the investment in on the water umpiring: "It is a spectacle which does not come around often and the boats are awesome. The boats look incredible so we like sailing here." Velsheda's tactican Tom Dodson summarised their regatta: "We got the starts we wanted both times and really we were just looking to be ahead of Lionheart in both races. But it did not work out. We had a good regatta though. But we learn we don't want to get in any kind of tacking duel with Lionheart. They acclerate so much faster. But then you can't give them any leverage. Half way up both first beats we were ahead and you can't afford to let them go. You have to go and hook them back in. But we are happy with winning three races in the regatta. We are making good progress and looking forwards to Cowes."